The castle of Franchimont near the small town of Theux is one of the largest medieval fortress of the province of Liège. 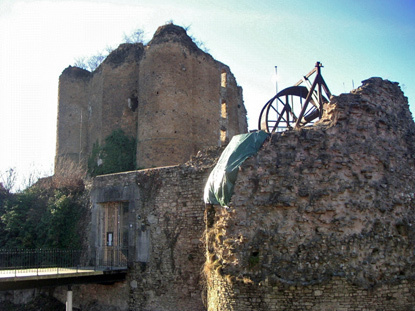 The castle was built in the 11th century (the exact date is unknown) and was the seat of the Marquisate of Franchimont, including the towns of Theux, Spa, Sart, Jalhay and later also Verviers, which originally belonged to the Prince-bishopric of Liège. In 1236, Waleran of Limbourg-Montjoie came into conflict with the Prince-bishop of Liège John of Eppes, destroying part of the castle. In the early 14th century, the (in)famous war between the Awans and the Waroux clans starts, and the Prince-bishops Adolph, and his successor Englebert of La Marck have to seek refuge in the castle. A fire breaks out in 1387 and badly damages the castle, but Prince-bishop Arnold of Hornes has it repaired immediately. In 1468, the people of Liège rebels against Prince-Bishop Louis of Bourbon, who receives support from Charles the Bold, Duke of Burgundy, and King Louis XI of France. 600 men from Franchimont (known in French as the 600 Franchimontois) then descend on Liège with the aim of killing the duke and the king, but failed. In 1477, Louis of Bourbon cedes Franchimont to William of La Marck, nicknamed "the Wild Boar of the Ardennes" (le Sanglier des Ardennes in French), in the hope to win his friendship. But William only grew stronger, further fortified the castle and killed Louis in 1482. William is assassinated in 1485, but his successor John of La Marck, and William's two brothers continue the struggle against the new Prince-bishop, John of Hornes. In January 1487, John of La Marck lays siege to Liège, but John of Hornes counter-attacks in July in Franchimont. John of Albret comes from France to join forces against Hornes, and the Prince-bishop is forced to leave the siege of Franchimont. The hostilities lasted until 1504. In 1503, Erard of La Marck becomes Prince-bishop of Liège, one of the greatest rulers the principality was to know in its history. Thanks to the strong position of Liège, holding cities like Huy, Bouillon and Couvin, the strategic importance of Franchimont declined and the castle was modified into a residential castle, with larger windows, a chapel, a vast kitchen and even a Renaissance-style gallery. 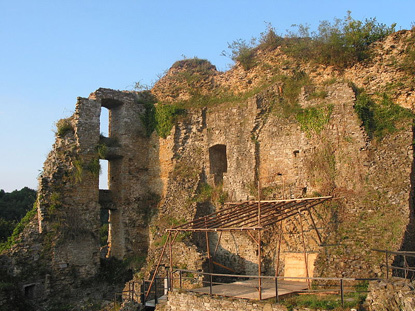 The castle suffered during the wars of religion in the 16th century and was progressively converted into a prison. In 1676, Louis XIV of France orders the destruction of the main tower of Franchimont, and an earthquake further damages the castle in 1692. From the French Revolution onwards, the castle was plundered and demolished. Scottish poet Walter Scott visited Franchimont during the Romantic period. The Belgian State aquired the ruins in 1899 and the first restoration took place between 1901 and 1907. Since 1973, the Franchimont Fair, held every two years, re-act the medieval life with costumes, artisans, medieval coins, and parade. Admission is 3 €, or 1.5 € for children from 4 to 12 and people over 60 years old. Franchimont can only be accessed by car. Take the E25 (Liège-Luxembourg) and the exit 45 for Theux, then follow the direction Theux-Spa for about 10km. Alternatively, take the E42 (Verviers-Prüm) and the exit 7 for Theux, then drive 4 more kilometers until Franchimont.